The Tubex Standard Plus (80-120mm dia) Tree Shelter Guard and Stake Packages offers a great tree planting protection kit, designed to help your whips and tree to establish themselves in the early years and guards against pests such as Rabbits, Hares, Sheep, Livestock and Deers. The tree planting package Green-tech offers in the Tubex Standard Plus tree shelters planting kit includes 1x tree shelter, 1x high quality wood support stake and ties. Tubex Standard Plus tree shelters are an ideal solution to providing protection from animals, to young trees during their most vulnerable stage. 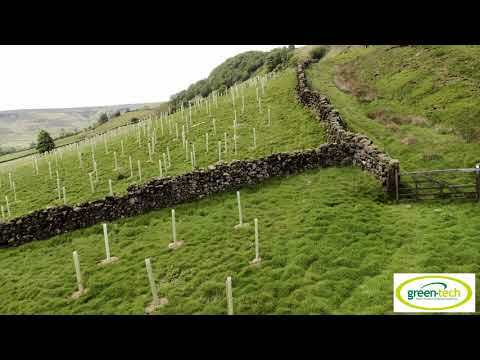 The Tubex Standard Plus tree shelters also provide a protected micro climate for trees, resulting in better initial establishment and higher survival rates. The Tubex Standard Plus tree shelters also retain moisture, therefore reducing water stress and helping the plant survive in dry conditions. The Tubex Standard Plus shelters are designed to gradually break down after approximately 5 years, ensuring that your tree is not restricted once established. The Tubex Standard Plus tree shelters features a flared rim to prevent chaffing. As well as protecting the young tree from the elements and herbicides, the Tubex Standard Plus tree shelter guard is ideal for the tougher tree planting jobs where protection is need from animals such as rabbits, hares, sheep, livestock, muntjac and deer.